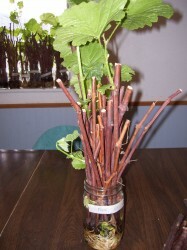 We trimmed our grape cuttings and put them in a jar around the middle of January. It is now time to transplant them into their own pots, or in this case, we will be holding them for a while in 16 oz. foam cups. 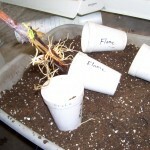 Some plants like the foam cups because they are warmer for the roots, and grapes are one of these. Grapes do not like to be cold and soggy. 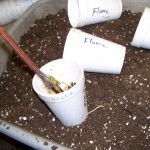 The foam cups use up the moisture quickly and have a smaller area for the roots. I would like to directly transplant into gallon pots, but would I lose a lot of plants due to the cold spring doing that. It seems like the roots just melt off and then the plant dies. As you can see from the picture, we have some healthy, strong roots. 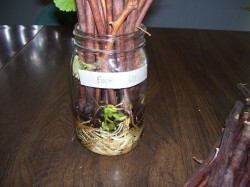 First, I label an empty jar to place the sticks in that are not quite ready to transplant. I then separate them into three piles: the good (transplantable), the bad (dead wood), and the ugly (the ones without healthy root and plant growth). The “ugly” starts go back into a labeled jar for some more growing time. 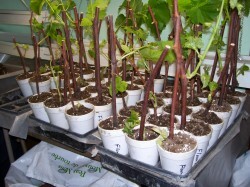 Label your cups clearly for the variety of grape that you are transplanting. It is easier to label them now than trying to tip the cup later to write on it. Next, poke holes in the bottom with a Cro-hook, just as I did with the smaller 8 oz. cups in “The Zucchini Story.” Gently separate the starts. Anything that you knock off will probably not grow back, especially the green growth, so be careful. Slip the start into the cup and sprinkle the dirt in until full. 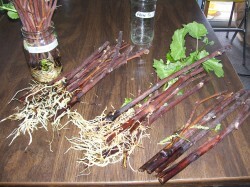 Shake it down but don’t firm it up too hard to avoid damaging the roots. Place the grape start and cup in a tray until the tray is full. 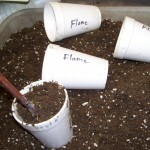 These can be watered with fertilizer water to stimulate root grown. I place them under a fluorescent light for a few days to let them settle in. After that, I move them to the greenhouse to harden off. Quality blog post, I actually wait for posts from you.